Occurring in different varieties, shapes, sizes and color, strawberries are undoubtedly the most popular berry in the world, so much so that during medieval French days, strawberries were believed to be an aphrodisiac. Even though there is no proof of the said aphrodisiacal properties, my love for strawberries has me thinking there is some truth to the theory. 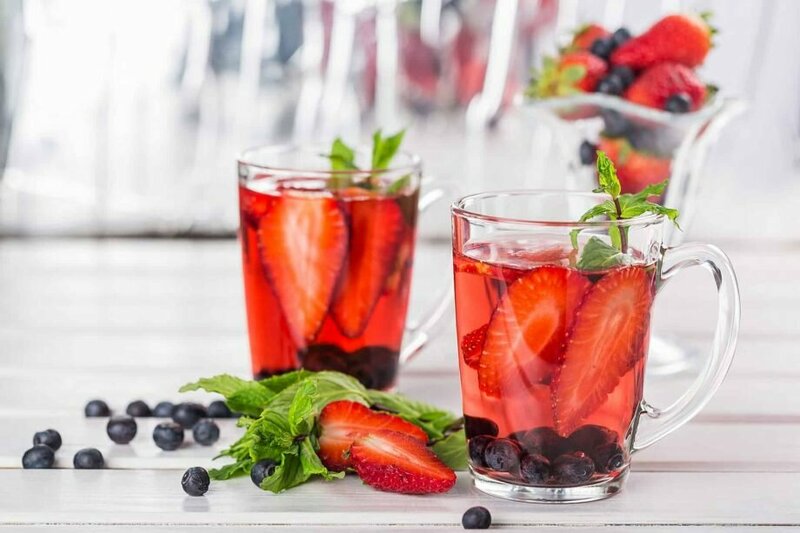 If their natural sweetness, heart shaped silhouette or pulsating color is not enticing enough, then the strawberry juice and it’s brimming nutritional and health benefits will have you swooning over these babies as much as I do. Hydration: Staying hydrated is essential particularly if you intended to maintain healthy skin and keep your energy levels up. The water content in the strawberry juice is a great way to stay hydrated especially if you like me dislike water and its plain taste. Boost your general brain health: The folate (naturally occurring form of vitamin B9) found in the strawberry juice helps increase your alertness, keep your mind sharp and improve your general concentration. It also goes a long way in enhancing your cognitive function. Weight control: A nutrient dense juice, strawberry juice contains high fiber and fructose content that keep you satiated for longer thus controlling your appetite. Strawberry juice also boosts your metabolism and cleanses your bowel for the ultimate detox effect on your body. Boost your immune system: We cannot talk about the health benefits acquired from drinking strawberry juice without mentioning the key role it plays in advancing your immune system and its functionalities. Strawberry juice contains generous amounts of Vitamin C and anti-oxidants. If you are looking to prevent and fight off aliments and other infectious diseases such as the common cold there is no better way of doing it than having your regular glass of strawberry juice. Strengthen your vision: One of the nutritional benefits acquired from strawberry juice is vitamin C. The vitamin see (pun intended) also promotes healthy ocular blood vessels and protects your eyesight by reducing the risk of cataracts and other age-related issues that may result in the loss of visual acuity. The potassium in the strawberry juice also normalizes your ocular pressure. Boost your energy levels: Picture a sweet cup of red goodness and if that doesn’t automatically bring you joy, I doubt anything else will. Strawberry juice is a quick source of energy and makes for an excellent on the go snack. Drinking strawberry juice also rouses the production of serotonin in your brain. Popularly known as the happy chemical, serotonin plays a key role in maintain mood balance and contributes to your general sense of well-being and happiness. If the few health benefits we have mentioned did not convince you to add strawberries into your cart during your next grocery run, then the nutritional benefits will be the deal closer. Strawberry juice when consumed in moderate amounts is packed with a variety of nutrients, antioxidants, minerals and vitamins which include but are not limited to vitamin C, B & E. It is also said to be void of fats and cholesterol but rich in fiber that is good for your diet. The delicious flavor that accompanies the strawberry juice is only a plus to the plethora of benefits you stand to gain. From prevention and management of ailments such as the flu, hypertension and diabetes nothing yells super drink like strawberry juice. If you haven’t already, be sure to try some strawberry juice and get high on health. Your body will definitely thank you.